This tri-band antenna covers 150-165, 450-470 & 806-940 MHz bands. Ideal for Public Safety applications when the user needs multiple bands but also needs to limit antenna installations. NOT tunable for amateur bands. A great little switching power supply! The Worlds most popular SWR/RF analyzer just got incredibly better and gives you more value than ever! MFJ-259B gives you a complete pictures of your antennas performance. You can read antenna SWR and Complex Impedance 1.8 to 170MHz Read Complex Impedance as series resistance and reactance (R+jX) or as magnitude (Z) and phase (degrees). You can determine velocity factor, coax cable loss in dB, length of coax and distance to a short or open in feet. You can read SWR, return loss and reflection coefficient at any frequency simultaneously at a single glance. Also read inductance in UH and capacitance in pF at RF frequencies. Large easy-to-read two line LCD screen and side-by-side meters clearly display your information. Built-in frequency counter, Ni-Cad charger circuit, battery saver, low battery warning and smooth re-duction drive tuning and much more. Super easy to use! Just set the bandswitch and tune the dial -- just like you transceiver. SWR and Complex Impedance are displayed instantly! Quarter-wave whip for 2 meters, with a tiny magmount that looks like a Hersey's kiss. The MFJ-401D Econo Keyer II is a microprocessor controlled keyer that provides iambic key operation and dot-and-dash memory to make sending perfect code easier. It has tunable code speed, code weight, and sidetone frequency; it supports both direct and grid-block keying outputs. You also get to choose between Iambic Type "A" and Type "B" keying. 300 Watt Antenna Tuner Full 1.8-30MHz Operation Custom designed inductor switch, 1000 volt tuning capacitors, Teflon insulation washers and proper L/C ratio gives you arc-free no worries operation with up to 300 Watts 1.8 to 30 MHz. Tunes any Antenna Tunes out SWR on dipoles, verticals, inverted vees, random wires, beams, mobile whips, shortwave receiving antennas.... Nearly anything! Use coax, random wire or balanced lines. Has heavy duty 4:1 balun. Work exciting 6 Meter DX from all over the world on ham radios "magic band"! Its an adventure every time you turn on your MFJ-9406 six meter SSB transceiver. Distant stations come rolling in loud and clear with crystal clean armchair copy. Youll have fun exploring exotic 50 MHz band openings -- Tropo, Sporadic E, F2, TE, Aurora, Meteor Scatter, and more. Ragchew with locals, hunt down new grid squares from far-away places from home, car or mountain top. Tiny 2meter/440 dual band antenna, with a tiny magmount that looks like a Hersey's Kiss. The MFJ-1700C is for folks that have multiple antennas and multiple receivers (or transceivers)! It can handle up to six radios and six antennas. The selection of the antenna and selection of the radio is made via two rotary switches. The MFJ-1700C has four mounting holes for desk or wall. It may be used for transmitting up to 2000 watts single sideband or 1000 watts Morse code at 50 to 75 ohms. SO-239 type jacks. Black aluminum. 4.5 x 7 x 3 inches. Now with built-in surge protection. MFJs tiny 36 inch diameter loop antenna lets you operate 15 through 40 Meters continuously -- including the WARC bands! Ideal for limited space -- apartments, small lots, motor homes, attics, or mobile homes. Enjoy both DX and local contacts mounted vertically. Get both low angle radiation for excellent DX and high angel radiation for local, close-in contacts. Handles 150 Watts. Super easy-to-use! Only MFJs super remote control has Auto Band Selection. It auto-tunes to desired band, then beeps to let you know. No control cable is needed. Fast/Slow tune buttons and built-in two range Cross-Needle SWR/Wattmeter lets you quickly tune to your exact frequency. All welded construction, no mechanical joints, welded butterfly capacitor with no rotating contacts, large 1.050 inch diameter round radiator -- not a lossy thing flat - strip -- gives you highest possible efficiency. Each plate in MFJs tuning capacitor is welded for low loss and polished to prevent high voltage arcing, welded to the radiator, has nylon bearing, anti-backlash mechanism, limit switches, continuous no-step DC motor -- gives smooth precision tuning. Heavy duty thick ABS plastic housing has ultraviolet inhibitor protection. The MFJ-948 Antenna Tuner has nearly all the features (except dummy load) of the MFJ-949E. Full 1.8-30MHz Operation 300 Watts 1.8 to 30 MHz. The MFJ-929 IntelliTuner-CompactTM lets you automatically tune any coax fed or random wire antenna 1.8-30 MHz at full 200 Watts SSB/CW. It can match 6-1600 Ohms (SWR up to 32:1) - - thats a 50% wider matching range at a higher power level than lesser competing products. You get a digital SWR/Wattmeter with backlit LCD, antenna switch for 2 antennas, built-in radio interface and built-in internal BiasTee for remote tuner operation. MFJs exclusive IntelliTuneTM, Adaptive SearchTM and InstantRecallTM algorithms give you ultra-fast automatic tuning with over 20,000 VirtualAntennaTM Memories. MFJ VirtualAntennaTM Memory MFJ new VirtualAntennaTM Memory system gives you 4 antenna memory banks for each of 2 antenna connectors. You can select up to 4 antennas on each antenna connector. Each antenna has 2500 memories. 4 Times the Solutions! MFJ-929 gives you 256 values each of capacitance and inductances for 131,072 matching solutions. Thats 4 times the 32,768 matching solutions of competing products with only 128 L/C values each! Highly intelligent, ultra-fast tuning! Dont be fooled by competing products claiming fast search times -- if you have a quarter of the matching solutions, of course, it takes less time to finish but its not faster. MFJs faster speed comes from advanced technology and software algorithms not from fewer matching solutions. MFJs IntelliTuner-CompactTM actually measures complex impedance -- R and X --of your antenna, computes the L-network values needed and snaps in those components to give you an instant match. If the load is out of measurement range, AdaptiveSearchTM determines the smaller sub-set from all solutions that can match a safe load -- and then searches only that subset -- others search through far more solutions. Digital LCD SWR/Wattmeter An easy-to-read, two-line, 16-character backlit LCD displays SWR, peak or average forward/reflected power, frequency, antenna 1 or 2, L/C tuner values, on/off indicators and other info. They are selected from easy-to-understand menus -- not complex combinations of buttons you canÃ¢â‚¬â„¢t remember. A fast-response, high-resolution bargraph gives you an auto-ranging 20/200 Watt power meter. You get 60 segments each for forward and reflected power and 36 segments for SWR -- try that with an 8 segment bargraph that makes you change power ranges and doesnÃ¢â‚¬â„¢t even give you reflected power! You can read inductance and capacitance directly in uHy and pF. This turns you into an expert L-network designer! Match your load, read the resulting L/C values, then use them to build your fixed L-network. Or, knowing the L/C values you can determine R and X of the load impedance. StickyTuneTM mode gives you one-hand tuning by locking the TUNE button -- just transmit to tune regardless of SWR. Has audio SWR meter and audio feed back. Competing products donÃ¢â‚¬â„¢t. Built-in 50 MHz frequency counter. Its built-in radio interface lets you use a simple wire cable to compatible rigs. Others require a cable with expensive electronics. Binding post for random wire. Self-test. Highly efficient L-network. 10 Amp/1000V relays, RF duty silver mica capacitors. 61/2 Wx23/4Hx71/2D in. 2.4 lbs. 12-15 VDC/ 1Amp or 110 VAC with MFJ-1316, $19.95. Operate 10 bands -- 75/80, 40, 30, 20, 17, 15, 12, 10, 6 and 2 Meters with this MFJ-1798 vertical antenna and get full size performance with no ground or radials! Full size performance gives high efficiency for more power radiated. Results? Stronger signals and more Q-5 QSOs. Full size performance also gives you exceptionally wide bandwidths so you can use more of you hard earned frequencies. Full size performance is achieved using separate full size radiators for 2-20 Meters and highly efficient end loading for 30, 40, 75/80 Meters. Get very low radiation angle for exciting DX, automatic bandswitching, omni-directional coverage, low SWR. Handles 1500 Watts PEP SSB. MFJs unique Elevated Top Feed elevates the feedpoint all the ay to the top of the antenna. It puts the maximum radiation point high up in the clear where it does the most good -- your signal gets out even if youre ground mounted. Its easy to tune because adjusting one band has minimum effect on the resonant frequencies of other bands. Self-supporting and just 20 feet tall, the MFJ-1798 mounts easily from ground level to tower top -- small lots, backyards, apartments, condos, roofs, tower mounts. Separate full size quarter wave radiators are used on 20, 17, 15, 12, 10 and 2 meters. On 6 Meters, the 17 Meter radiator becomes a 3/4 wave radiator. The active radiator works as a stub to decouple everything beyond it. In phase antenna current flows in all parallel radiators. This forms a very large equivalent radiator and gives you incredible bandwidths. Radiator stubs provide automatic bandswitching -- absolutely no loss due to loading coils or traps. On 30,40, 75/80 Meters, end loading -- the most efficient form of loading -- gives you highly efficient performance, excellent bandwidth, low angle radiation and automatic bandswitching. MFJs unique Frequency Adaptive L-Network provides automatic impedance matching for lowest SWR on these low bands. Tuning to your favorite part of these bands is simple and is done at the bottom of the antenna. you dont need a ground or radials because an effective counterpoise thats 12 feet across gives you excellent ground isolation. You can mount it from ground level to roof top and get awesome performance. The feedline is decoupled and isolated from the antenna with MFJs exclusive AirCore high power current balun. Its wound with Teflon coax and cant saturate, no matter how high you power. Incredibly strong solid fiberglass rod and large diameter 6061 T-6 aircraft strength aluminum tubing is in the main structure. Efficient high-Q coils are wound on tough low loss fiberglass forms using highly weather resistant Teflon covered wires. MFJ Grandmaster SWR/Power meters are the Cadillacs of ham radio! If you simply will not settle for less than the best accuracy and precision these MFJ GrandMasters are for you. You get a large 3.25x1.25 inch precision illuminated meter for easy wide-angle viewing. A highly visible black and red meter scale on a bright white background makes it quick and easy to read SWR, forward or reflected power. Meter lamp requires 13.8 VDC or 110 VAC. Power pigtail included for wiring. A functional and simple front panel layout lets you select power ranges, bands or make SWR readings intuitively. The GrandMaster series feature an SWR scale that expands the full view of the meter 3:1 SWR is centered at mid-scale to give you precision and wide-range measurements. All GrandMaster feature peak and average, forward and reflected power readings and have selectable power ranges. each GrandMaster is housed in an all metal cabinet with rubber feet and protected by durable speckled black paint. A designer injection molded grey front panel perfectly matches any transceiver. Air dielectric SO-239 connectors with gold plated center pins gives superb performance to beyond 525MHz. All GrandMaster Meters are precisely factor calibrated for accurate measurements. MFJ-873 HF SWR/Power Meter. Covers VHF/UHF (125 - 525 MHz). 5, 20, 200 Watt power ranges. MFJ-864 Cross-Needle Meter reads forward and reflected power and SWR simultaneously at a single glance. It features separate HF and VHF/UHF directional couplers, each with its own SO-239 connectors. This lets you connect your HF and VHF/UHF transceivers at the same time. You can then monitor SWR and power of either transceiver at the flick of switch. Others have a single set of connectors -- you have to plug and unplug to use separate HF or VHF rigs. Power ranges: 30/300 Watts forward and 6/60 watts reflected Each power range for each band is individually calibrated. Schottky diodes are used for best accuracy. MFJ-4115 is supercompact, great for traveling -- weighs just 11/2 lbs and is a tiny 3 3/4W x 2 1/4H x 7 3/4 D inches. This tiny supply will easily fit in your briefcase or suitcase and power most VHF/UHF or QRP radios. Has over-voltage and over-current protection systems and works with AC input from 90 to 130 Volts. Output is 13.8 VDC, 17 Amps surge and 15 Amps continuous. It has one set of 5-way binding post connections. It is super clean, has a quiet fan and super regulation. Has load fault indicator and automatic shut-down. This is my very first Ham Radio I found a few cheap Workman 104 Mobile In Line Swr Meter Vhf Uhf Ideal For Auto And Boat for their chamstirs gift. Shipping and delivery was quick, this Ham Radio is precisely what I envisioned.Many other Ham Radio makers have duplicated this Ham Radio. In addition, on this Crystal Radio Output Matching Auto Transformer 200K 32; so far it has really been a terrific investment.Looking to get a new Ldg At 11 Auto Tuner on ebay the other night. The compact MFJ-962D handles 1500 Watts PEP SSB amplifier input power (800 Watts PEP SSB amplifier output power). Its perfect for Ameritrons best selling 800 Watt AL-811H or 600 Watt AL-811 amplifiers! MFJ-962D is new and improved! New features include MFJs AirCore Roller Inductor, new aluminum-skirted knob set including a weighted deluxe spinner knob, ultra compact size (10.75 x 4 x 10.875 inches) and scratch-proof multi-colored Lexan front panel. Two transmitting tuning capacitors and MFJs exclusive AirCore roller inductor gives you precise control to get your SWR down to an absolute minimum. You get an extremely wide matching range from 1.8 to 30 MHz continuously including MARS and WARC bands.MFJs AirCore roller inductor has an air core that cant burn up. You get ultra high-Q, low loss and MFJs exclusive Self-Resonance Killer that eliminates damaging self-resonances. MFJs lighted peak and average reading Cross-Needle SWR/Wattmeter makes tuning quick and easy. At one glance you can read SWR, forward and reflected power in two power ranges. Meter light uses 12 VDC or 110 VAC with MFJ-1312D. A 6-position ceramic antenna switch lets you select 2 coax lines (direct or through tuner), random wire and balanced lines. You get a heavy duty MFJ TrueCurrentBalun for balanced lines. High-voltage ceramic feedthru insulators let you operate high power into balanced feedlines. 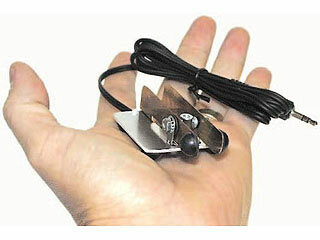 This miniature, lightweight Iambic paddle is just 1.75Wx1.75Dx.75H inches. Tiny enough to fit in an Altoids tin (cord and all!) for protection. Its perfect for traveling or for home use with QRP or "big" rigs. Throw it in your briefcase along with your MFJ QRPCub or your other favorite transceiver. The paddle is precision formed from special phosphorous bronze spring material with an A150 temper. This gives you an excellent feel so you can send smooth CW. Mounted on rugged metal base with non-skid rubber feet. Complete with four foot cord and 3.5 mm plug -- ready to plug into your keyer or rig! MFJ's ⅝ Wave on 2 Meters gives you the maximum possible theoretical gain of any single element mobile antenna -- no matter how much others cost. On 6 Meters, the MFJ-1728B is a high performance full quarter wave antenna. Its an excellent companion for your MFJ-9406, MFJ-9406, or other 6 Meter mobile or handheld transceiver. Gives you great "Magic band" signals used mobile or as a base station antenna. Its perfect for your mobile or HT. Free BNC handheld adapter. Its rated at 300 Watts PEP - its amplifier ready Low SWR lets your transceiver deliver full power safely. A Heavy duty magnet mount holds your antenna tight at highway speeds. You get 12 feet of coax and a stainless steel radiator that will endure years of harsh mobile use. Easy to take down with an Allen wrench. Covers all bands, 160-10 Meters with antenna tuner. 102 feet long, shorter than 80 Meter dipole. Use as inverted vee or sloper to be more compact. Use on 160 Meters as Marconi with tuner and ground. Handles full legal limit power. Add coax feedline -- get on the air!